Suselaine Marius dreams big. 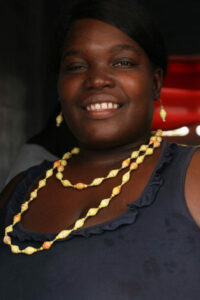 She is part of The Haitian Bead Project cooperative in Pignon, Haiti. She currently manages a little storefront owned by her family, where she sells cold drinks, cell phone minutes, and select groceries. She is an entrepreneur in her own right. In the afternoons, when she’s not fetching cold drinks for customers or typing in codes for cell phone users, she passes the time rolling recycled cardboard beads. Suselaine says she wants to save her money from making jewelry to one day build a hotel in her home town. She wants the hotel to have a restaurant. She grins wide just thinking about serving visitors from all over. Suselaine also has a big heart. A few years ago she decided that she was going to act on one of her dreams. She adopted a little girl named Jessica. Suselaine did not worry about being a single woman in rural Haiti. She knew she had the family support. She had confidence she could provide love for a little one in need. Today Suselaine uses her earnings to send Jessica to a local preschool. Suselaine became a master this Fall at making Christmas star ornaments. She started making a new style of long necklace, bracelet and earring sets with chunky beads in bright colors like turquoise and red. Suselaine is not afraid to dream and put her creativity to use achieving those dreams.